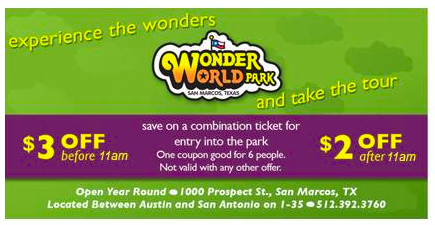 Wonder World Park in San Marcus, Texas - Get savings coupon! Explore the fun at this cave tour and attractions at Wonder World Park, a truly unique theme park. See Texas’s earthquake cave and experience up close the devastation of a major earthquake. "Stadivator" from the cave high into the Tejas Tower for overview of the Balcones Fault escarpment. Rock out inside the topsy-turvy world of the anti-gravity house. Board a train and splash through the falls of Mystery Mountain on the way to Texas Wildlife Petting Park.